Habit: Perennial herb 15--45 cm, few-branched, gray-green, hairs +- bristly, unbranched, nonglandular. Leaf: 20--70 mm, lance-linear; lobes (0)3--5, widely spreading. Inflorescence: 4--15 cm; bracts 20--30 mm, lobes 3--5, bright red to +- yellow-orange. 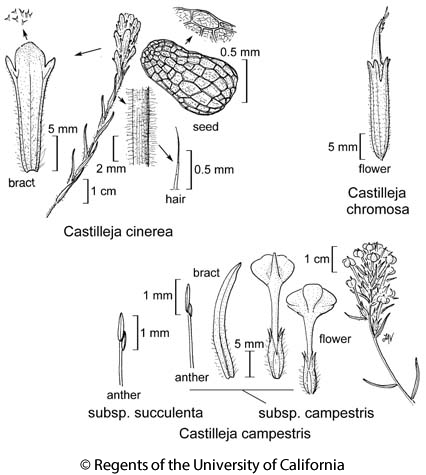 Flower: calyx 15--25 mm, divided 1/4--1/3 abaxially and adaxially, +- 1/7 on sides, long-nonglandular- and short-glandular-hairy, lobes obtuse to rounded; corolla 20--35 mm, beak +- = tube, +- yellow-green, adaxially puberulent, margins +- red, lower lip 2--3 mm, dark green, included; stigma 2-lobed. Fruit: 10--15 mm. Seed: 1.5--2 mm; coat deeply netted, most walls ladder-like. Chromosomes: 2n=24,48. Synonyms: Castilleja angustifolia (Nutt.) G. Don, misappl. Citation for this treatment: Margriet Wetherwax, T.I. Chuang & Lawrence R. Heckard 2012, Castilleja chromosa, in Jepson Flora Project (eds.) Jepson eFlora, http://ucjeps.berkeley.edu/eflora/eflora_display.php?tid=18160, accessed on April 19, 2019. CaRH, s SNH, ne SnBr, GB, DMoj; Markers link to CCH specimen records. Yellow markers indicate records that may provide evidence for eFlora range revision or may have georeferencing or identification issues. Purple markers indicate specimens collected from a garden, greenhouse, or other non-wild location.